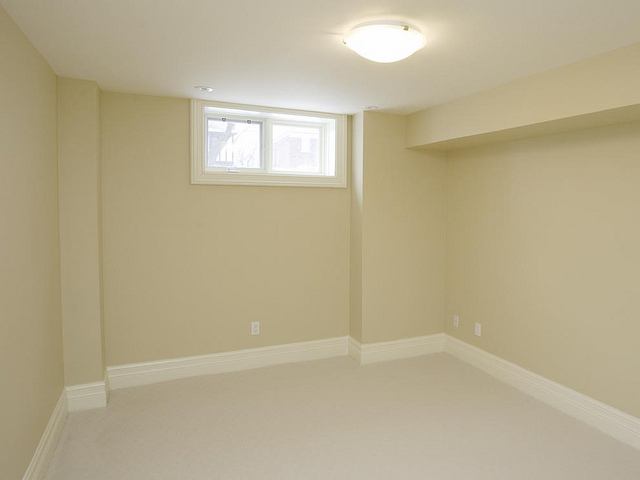 The great thing about moving into a house with an unfinished basement is that you have a blank canvas to work with. You get to be creative and make it your own. 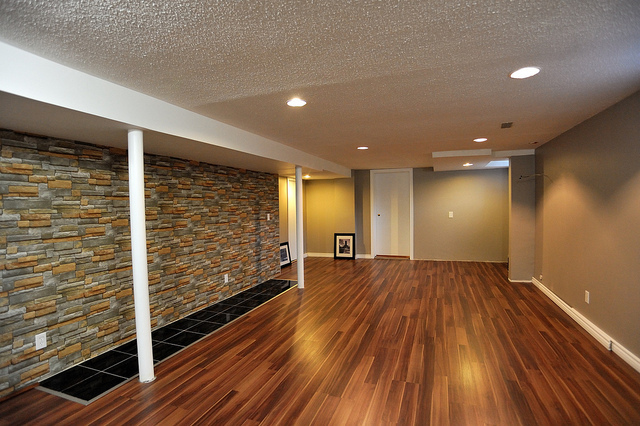 So how do you design a great basement on a budget? You get creative! Basement decorating ideas on a budget may take some time but can be a lot of fun for a family to do together. The walls can easily get a nice neutral colour of paint, and maybe splurge on a gallon of one bright colour and make an accent wall. To add some accents go to garage sales, flea markets or good will stores. You can often find great big paintings and pictures that will make the perfect accent for your basement walls for a much better price then going to art dealers. If you really want to decorate your basement on a budget but make it personalized take pictures from your own collection, of family trips or nature and frame them with dollar store frames. This adds a personalized touch on a budget. The best place to start for furniture is to go to second hand stores and find some great furniture for half the price of what the big furniture stores are selling them for. You can find some great chairs and couches that may not be the right fabric but are in great condition. Start with the basics and go to a fabric store and buy some end of the line fabric and reupholster the chairs to match your taste. Then you can go and buy a basic couch cover to match the chairs and throw it over your second hand couch. Using the same fabric from the chairs you can make some great throw pillows. If your floors are cement or hard and you want a nice soft rug check out the clearance areas of carpet stores. You can get end of the line or last years carpet scraps which make great area rugs. These add softness and warmth to your blank floors. 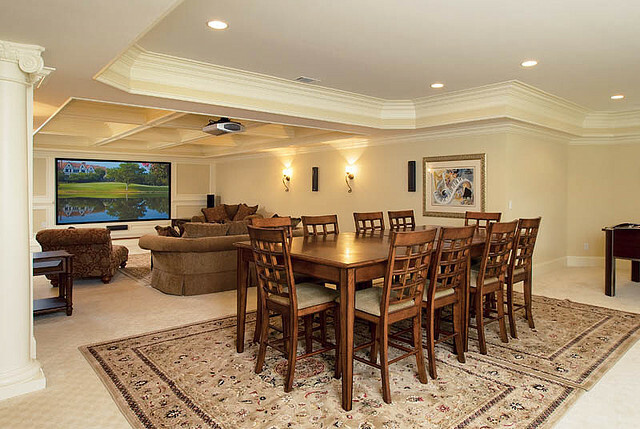 If you are making your basement design to have different section get a few smaller pieces to visually add separation in one large room. If you have any family members who are moving or changing their house ask if they have any furniture, lights or pictures they are getting rid of. These can be great additions to your basement design for free! Older family pieces easily be updated and your family will be jealous that they didn’t think of doing the same thing and saving money on their own! Basement designs should be functional but fun, that’s why going to a second hand store, can be the best place to go. Buying a cheap used cabinet or old shelving unit sand it down and then add some stain or paint and you have a customized beautiful unit that your friends will love and you can take all the credit for. Look through your attic or other storage area and dust off those old candles or lamps and use them. If the lamps are older you can change the shade, shine up the base or paint it a different colour to match your décor. Its an easy and free way to add some light to an otherwise dark part of your house while reducing the clutter in your storage areas. If you have shelves but want to add some colour to them you can go to the dollar store and look for shelf liners. These easy to install coloured fabric add a pop of colour and functionality to your shelves. For storing kid’s toys and pet toys why not buy some fabric boxes from the dollar store while you are there, these reduce clutter and look pretty sitting on a shelf. If you want to add in a kid friendly area to your basement designs you can buy some chalkboard paint and make a chalkboard wall to your basement. It’s a fun design and will stop your kids from drawing on the walls in the rest of your place. Saves on cleaning and gives your kids a great place to be creative. These basement decorating ideas on a budget can make a plain basement into a warm and inviting area for family and friends to gather and enjoy a fun night. All you need is an open and creative mind to take older pieces and rejuvenate them for a functional and fun looking basement.